It has been a long time since I updated the website, life got in the way this past year. I will be closing the website for good at the end of February, I have to renew my web hosting by then, and it will be costing me more than I get in sales, so it is not worth it for me to continue on with it. I probably will start another blog somewhere, I will let you know where, and I will list some of my things on it, with prices, but there will not be an online store, so you will have to email and ask for the item(s) and the shipping cost, and I will send you a paypal invoice. In the last couple of weeks I have been adding a few more things, all of them are on sale. I have added all the books I still have available, and they are all 90% off, which means that most of them are less than $10. You can’t find them anywhere else for that price!! I have also added a few more yarns at very good prices, check out the ones under the Nova brand, all of them are less than $2.00 a ball, can’t beat that price! For those who like to knit with the Sirdar Snowflake, check out the Ilayda, it is very similar but it has a bit of sparkle to it, and it is 100% nylon, so feels nicer to knit with than the polyester. Yes there is still a bit of Snowflake left for those who would rather have the original. I am in the process of adding lots of patterns, all at 50% off. these are the more expensive patterns from indie designers, not the big yarn company ones. There is Fiddlesticks Knitting, Cottage Creations, Lucy Neatby designs, and others, with more coming. One brand new thing is handwoven teatowels. These are made by me. They make great gifts for weddings, housewarming etc. Or get some for yourself, they are very thirsty !00% cotton towels in interesting designs. A note about postage….I have had a lot of questions about the cost of the shipping, since it seems to be high compared to the cost of the goods purchased. I only charge what Canada Post charges me, which is high I know, but there is nothing I can do about that. With almost all the things on my website being on sale, and a lot of them below what was my cost price, I can’t afford to give discounts on the shipping. Also I have 4 different knitting machines and an industrial type embroidery machine for sale. If you, or someone you know would like more information about these, please email me at info@yarnshop.ca. For those who might be interested, here are a few things I have been making in the past year. Not much of knitting, and most of those not finished, but I have been doing some miniature stitching, as well as some lacemaking as in bobbin lace. This little rug is for a dollhouse that fits in a dollhouse the scale is 1/144. A dollhouse is 1/12 scale, which means that every inch in a dollhouse is equivalent to 1 foot in real life. so a dollhouse for a dollhouse is 1/12 of 1/12. the tape measure beside the rug is in centimeters. It is stitches with fine silk thread at 60 stitches per inch. This is a Christmas stocking for a dollhouse, 1/12 scale. It is stitched with 1 strand of embroidery floss at 40 stitches per inch. This one is a pillow for a 1/12 scale nursery roombox. it is stitches with 1 strand of embroidery floss at 40 stitches per inch. Of course, the knitting is done, but is till needs to be put together. I love the name for this vest Ulala. It is called Spring Plumage. these designs are all fun to knit. They all use short row techniques, which is what gives the curving shapes. Once you learn how to do it, it is quite easy, you never knit with more than one colour at the time, and it is a great way to use those long striping yarns, there are even some patterns available that can be done with sock yarn. Most of the patterns are of German or European designers, but they do get translated into English, so we can all knit them. do a search on Ravelry for Swing Knitting, there is one designer who has several tutorials available for sale, which once you follow them allows you to do your own designing. It is a lot easier than Kaffe Fassett’s intarsia knitting, and more interesting than modular knitting. The way I found these patterns was kind of funny. A year or so ago I was reading a blog of another weaver, who also knits, and she mentioned that she had found a scarf pattern on Ravelry and showed a picture of it. Thought it was interesting, so went onto Ravelry to find it (Wingspan), which was free at the time, and saw quite a few others that were based on this pattern. 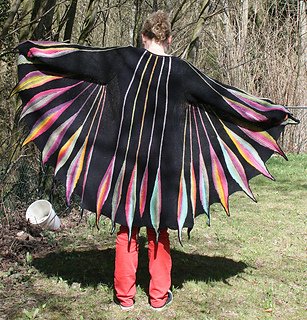 One of which was Dreambird, which I ended up purchasing (though I haven’t knit it yet). it looked interesting, and read about Swing Knitting that it was based on. so back to Ravelry and do a search on Swing Knitting, and that is when I found Heidrun’s tutorials and designs, and also designs by Nadita. It is called Drachenfeuer. It is a shawl pattern, and I already have more shawls and shawl patterns than I know what to do with, so I am going to turn it into a skirt. I did a test sample, and since I don’t want a floor length skirt, I am using the shorter version of this shawl. Needless to say, reading blogs can end up being very hard on the pocketbook…..and sidetracks you from getting all the other knitting projects that have been sitting around for years done. And here is one of the lace up close. There are some loose thread ends that will be cut off after the lace is finished.